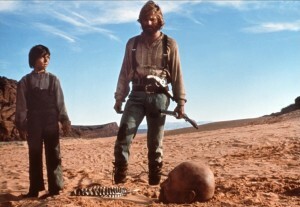 This is perhaps the best mountain man movie ever made, although that’s kind of a limited field. Robert Redford was a hot acting commodity in the years between Butch Cassidy and The Way We Were, and this was his second western. 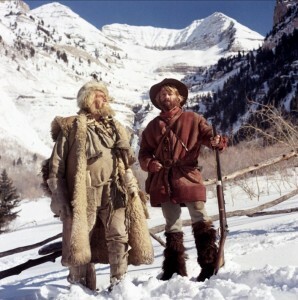 It was filmed in Utah, much of it on the back side of Mount Timpanogos near Redford’s adoptive home. Redford had been so taken with the Timp Haven ski resort there that he bought it and renamed it Sundance, after his character in Butch Cassidy. Redford’s well-known ecological sensitivity is on display in the film. 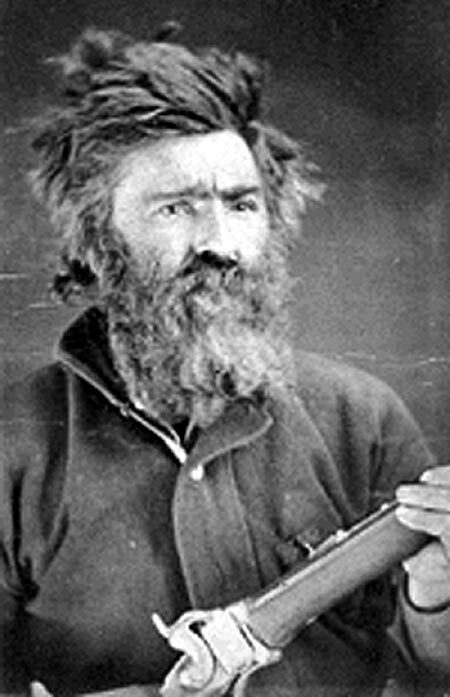 Jeremiah Johnson (or John Johnston) was an actual historical character during the late fur-trapping period. He was sometimes referred to as Liver-Eating Johnson for his supposed culinary inclinations during a lengthy feud with the Crow Indians in Montana and Wyoming. His story is as much legend as fact, however. This movie conveys the beauty, the solitude and the dangers of the early west during that late fur-trapping period. It depends on Redford’s star power to carry it, and he’s up to the task. Jeremiah Johnson is a disillusioned soldier from the Mexican War who heads as far away from people and civilization as he can get. That puts the start of this movie in the late 1840s, after most of the fur-trapping era was done. He goes to the mountains in the vicinity of Montana, with references to the Judith and Musselshell rivers of that state. 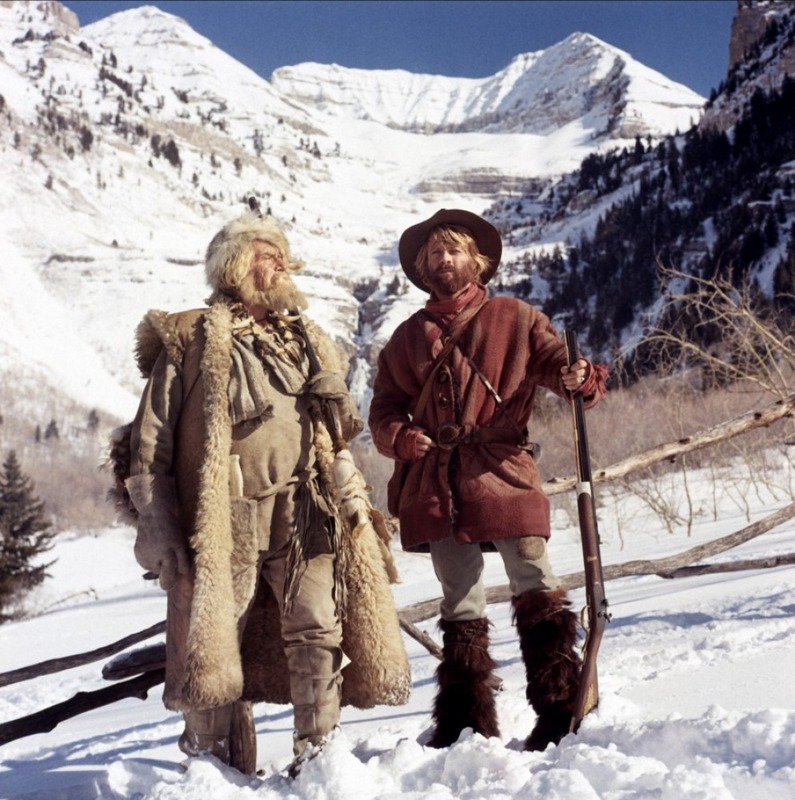 He encounters Bear Claw (Will Geer), an older mountain man whose specialty is hunting grizzly bears and who teaches him the basics of mountain hunting and survival. Johnson later comes across Del Gue, a different kind of loud-talking trapper played by Stefan Gierasch. Johnson accidentally acquires a family, taking on the mute young son of a crazy woman and receiving a Flathead wife in a situation where he can’t argue or refuse. Johnson and his mentor Bear Claw (Will Geer). While guiding a party of soldiers to rescue stranded emigrants, he unwillingly (but not unwittingly) trespasses on a Crow burial ground, thereby touching off a feud with that tribe. Taking revenge for the Crow killing of his Flathead wife and adoptive son, Johnson kills several of the Crows and the feud is on. Once the feud has started, the Crows come at him one by one, as a point of honor. Johnson doesn’t come out of these encounters unscathed, but he wins each one. There’s no eating of livers in the movie, however. The final scene is a wordless encounter with Paints-His-Shirt-Red (Joaquin Martinez), Johnson’s avowed enemy since mid-film and the presumed force behind the attacks on Johnson. 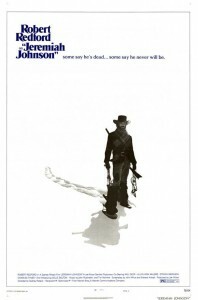 Several hundred yards apart, Johnson reaches for his rifle for what he thinks will be a final duel, but Paints-His-Shirt-Red raises his arm, open-palmed, in a gesture of peace that Johnson returns, closing the film. Some feel that the portions of the film where there isn’t much dialogue—and there are a lot of them—drag a bit. The end feels abrupt and lacking in resolution, as if somebody just got tired of telling the story and quit. Johnson and Caleb encounter Del Gue. 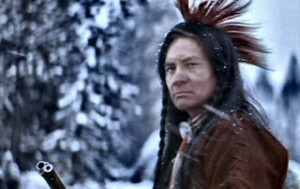 The Indians in this movie look very authentic, if occasionally somewhat overdressed. In particular, Delle Bolton, who plays Johnson’s quiet young Flathead wife Swan, is very effective in a limited role. Redford doesn’t have the imposing physical size of the real Johnston, but he’s very good at the central role of the movie, maintaining an innate sense of mystery about his character. Sidney Pollack was an excellent director not particularly known for westerns. He was talked into doing this one by Redford, who made seven movies with him. Something like this, with comparatively little dialogue, requires very high composition skills to take advantage of the natural setting, which becomes a primary character. And it’s not just showing the mountains and background. There’s a scene in which Johnson is shot from his horse and plays dead on the ground, while his assailant comes up behind him. The camera work and editing are masterful in indicating clearly where Johnson lies, where his horse is standing and where the out-of-focus Indian that Johnson can’t see is coming from. It must have been extremely hard to set it up so the action is that clear but mostly implied from Johnson’s point of view. 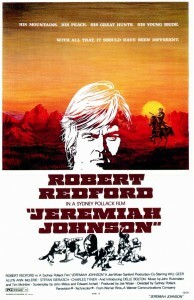 Sam Peckinpah was originally attached the project to direct, with Clint Eastwood slated to star. But Peckinpah and Eastwood did not get along, so Peckinpah left the project (just as well, probably); then Eastwood decided to make Dirty Harry instead. The script with its notably spare dialogue was originally written by John Milius, who says he was paid $5,000 to write it at first. But he was then hired to rewrite it several times and wound up earning $80,000 on it, with Edward Anhalt. Milius says he got the script’s idiom and American spirit from Carl Sandburg and was also influenced by Charles Portis’ novel True Grit. The bones of the story are based on Raymond Thorp and Robert Bunker’s supposedly non-fiction book Crow Killer: The Saga of Liver-Eating Johnson and Vardis Fisher’s novel Mountain Man. The music by Tim McIntire (the son of actors John McIntire and Jeanette Nolan, who also provides the voice-over narration for the film) and John Rubinstein (the son of internationally-known Polish pianist Artur Rubinstein) is a little pretentious for a western, with an overture and entr’acte. But this is not a typical western, and the music works well enough in its way. Visually, this is an extraordinarily beautiful movie, focusing on the skillfully chosen natural settings. And Redford himself was seldom more beautiful, too. According to Hal Herring in Field & Stream (May 2012), this is “an epic about loss, and how change will take from us everything we love, but that there are, indeed, things that endure. Some people think it’s the greatest outdoor adventure movie ever made.” For the second-best mountain man movie, try Howard Hawks‘ The Big Sky, from 1952. This entry was posted in 55 Greatest Westerns and tagged Edward Anhalt, Mountain Men, Native Americans (Indians), Robert Redford on August 23, 2013 by Nicholas Chennault. Just saw it again tonight for the first time in many a year. Picked up the DVD in a pawn shop earlier today for 1/2 a buck. It is an excellent, strangely touching film. Redford (who, as a rule, I’m not a particular fan of) is superb in the titular role. The supporting cast is equally fine. Johnson’s squaw, Swan, played by Delle Bolton, is a revelation. Highly recommended…by this writer, in any event.